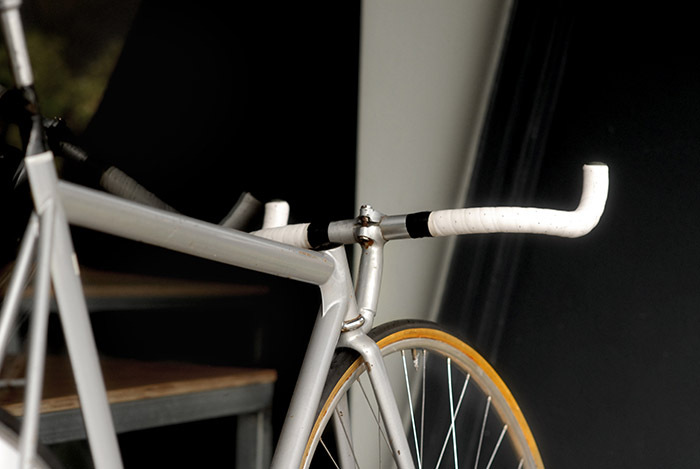 Handmade, custom racing bicycles. Built in Zurich by Leo Estermann. The story of the famous Swiss bike frame builder. Cycles Estermann Zurich was founded by Leo Estermann in about 1939, by 1960 the workshop was located behind Restaurant Felsenberg in Seebach, Zurich Switzerland. Leo Estermann built his bespoke racing frames for elite riders as well as discerning customers who required a custom built frame, initially building lugged frames and probably progressed to the fillet brazed work when the fad for funny bikes began to take hold in the late 1970's. Leo Estermann was also President of Velo Club Affoltern (VCA). Incidentally the Ital Cicli Systems workshops of the 1970's and 1980's at Hardturmstr 135 Zurich weren't far from Leo Estermann's frame building enterprise. This is the story of how a Leo Estermann, Zurich built track funny bike made it's way to Australia and was raced by one of Australia's fastest sprinters. The beginnings of Estermann Cycles Zurich. 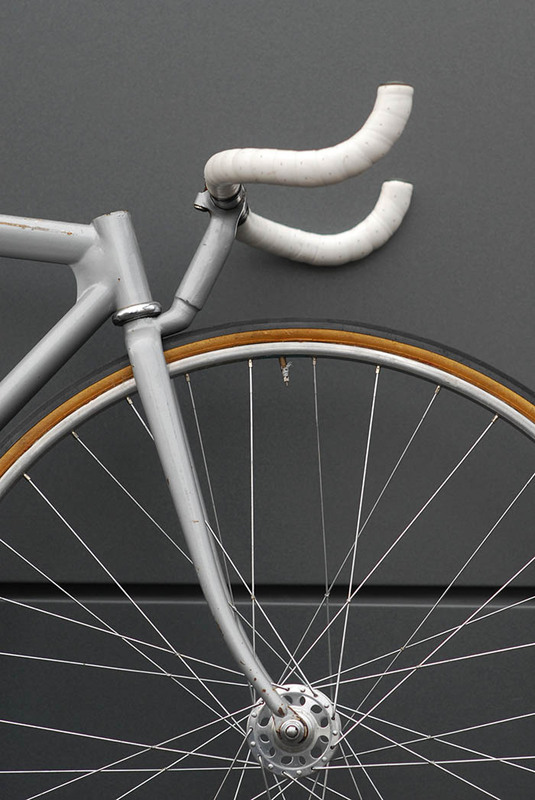 Thanks to Thomas a Swiss bicycle enthusiast, we now know the early history of Estermann Cycles. Thomas has owned an Estermann with the frame number 170, built right after World War II in 1946. The date confirmed using Estermann's frame number book which is still in the hands of another Estermann Cycles aficionado. The 1946 Estermann is equipped with Campagnolo Cambio Corsa, is hand pin lined with partially triple chrome plated chain stays. The Cambio Corsa equipped Estermann bears the mark of Estermann's trademark upper case smashed letters, with ESTERMANN impressed indelibly into the steel of the yellow painted seat tube. The list of elite and professional riders who Estermann built bikes for is extensive, including Koblet, Kübler and Dill Bundi for starters. An Estermann sketchbook completes the records still available for study, recording sketches of the bikes Estermann built over decades for cycling royalty. By 1981 champion Australian sprint cyclist Kenrick Tucker was beginning to make his mark as one of Australia's top sprinters of all time. Kenrick had won the 1977 Australian Junior sprint championship then finished fifth that year at the World Junior sprint championship. Kenrick followed up by winning the 1978 Australian senior sprint title and the Commonwealth Games sprint championship as well as finishing second in the 1000 metre time trial in Edmonton, Canada. The following two years Kenrick won both the Australian sprint and 1000 metre time trial championships. During that period Kenrick raced at the Moscow Olympics and at track race meets throughout Europe. In August 1981 Kenrick was competing in the Coupe D'Europe Coq Sportiff at the Offene Rennbahn Zürich-Oerlikon, Switzerland. Other Aussies on the bill were Frank Parker, Byron Tucker and Gary Sutton. The outdoor Zurich velodrome was located a short distance from Cycles Estermann, then operating from the basement of Leo Estermann's home at Katzenbachstrasse 122 Seebach. A few months later Kenrick won the 1982 Australian 1000 metre time trial championship at Chandler Velodrome in Brisbane, racing on the Leo Estermann built funny bike. The combination of the new bike and the new velodrome obviously worked, Kenrick said "It's the fastest track I've ever been on, and I could have gone a lot faster if there had been no wind." National Cycling magazine published a picture of Kenrick's Estermann time trial bike, with Kenrick on the start line at Chandler Velodrome in March 1982. Jason wrote "It's Kenrick's old bike and recently I'd asked Kenrick if he wanted to buy it back from me, obviously he wasn't interested so a couple of years ago I sold the bike to a local Brisbane bike collector, Brian, now the Kenrick Tucker bike is on display at Crankstar in Brisbane. When I was a young kid kicking about in Rocky and was racing Juvenile I used to admire Kenrick's Estermann bike, it was displayed in a local shop window. I'd bought the Estermann TT track bike from Kenrick back in 1986, Kenrick was getting married and needed some extra cash, he had always told me it was an Estermann frame from Switzerland. I've passed the history of the Estermann bike onto Brian, now I'm kicking myself like anyone who wishes they had kept their bikes, I wish I'd kept it. There is a red sticker just under the seat post that you could read the words Estermann which has since faded. Originally the handlebar tape was black cloth and they are Cinelli bars, I think at one time Lawrie Cranley also owned or used the Estermann bike, originally the seat was a brown brooks saddle. The black seat tube was originally grey as it cracked and was touched up, I rode this bike in junior teams pursuit state titles gold and silver for Rocky (Rockhampton). There's an example of an Estermann road TT funny bike that was built around the same time in the Speed Bicycles archive. Both bikes are built using the same fillet brazing technique and are very similar. At least from 1946 Leo Estermann stamped his name into the tube sets of his custom frames, using smashed upper case letters, not always in the same position on the frame. 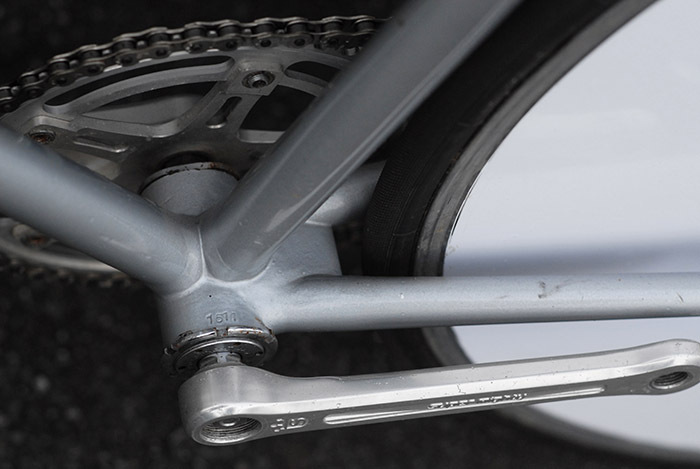 The smashed letters on the Kenrick Tucker, Estermann track time trial bike, aren't as clearly discernible as other examples, with the NN showing as VV on the top of the head tube. According to local sources, later Estermann bikes were nearly always painted in a light blue colour, not too dissimilar to the Kenrick Tucker bike. 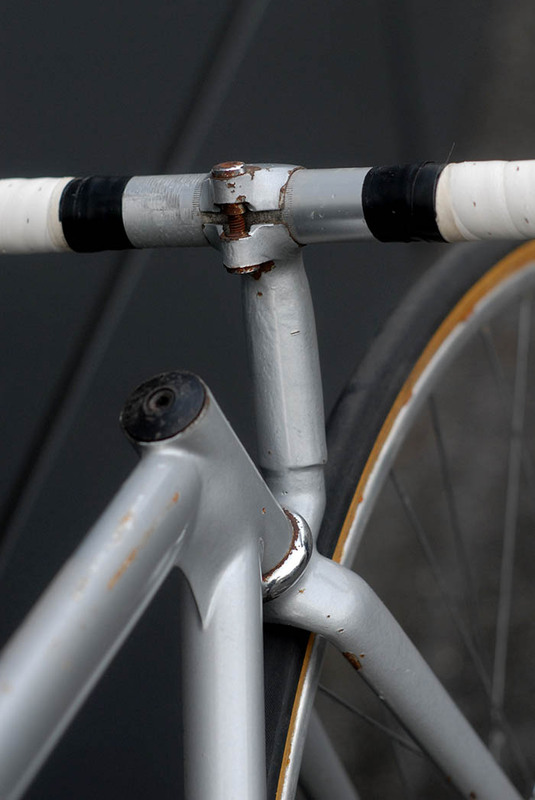 Renowned Swiss bicycle mechanic Fritz Bruehlmann mentions that he had frames built by Estermann and that they were nearly always painted in the trademark light blue Estermann colour. Leo Estermann's old workshop underneath his flat at Katzenbachstrasse in Seebach has now been replaced by modern unit blocks and Leo passed away a few years back. At least one Leo Estermann track bike is still viewed and admired by many as they fuel up on caffeine at Crankstar Bespoke in Brisbane Australia each morning, thanks to Brian the current custodian of this well known and experimental funny bike. All photographs by Robert Cobcroft, shot outside Crankstar Bespoke Cyclery Brisbane. With thanks to Crankstar Bespoke, Geoff Scott of Gefsco - Clamont fame, Jason Reed, Brian Pwac and the crew at Pushies Galore. Check out Speed Bicycles and History of Seebach site for more information on Leo Estermann. Leo Estermann Zurich custom frame builder. Circa 1980 track pursuit bike, low pro - funny bike. Raced by Australian sprint cyclist Kenrick Tucker in 1000 metre time trials. Early experiments in steel performed by custom frame builders like Leo Estermann opened the way for new technological advances in bicycle design. The black seat tube on this Leo Estermann track time trial bike was originally grey. A crack appeared in the steel tube, was repaired and painted black. Aero tubing on Leo Estermann's Zurich built track funny bike. For racers like Kenrick Tucker, the new tube profiles were meant to help shave off precious seconds in time trials. Some components are not the same as when Kenrick Tucker raced around Chandler velodrome to win the Australian 1000 metre time trial on this LEo Estermann built bike, in March 1982. 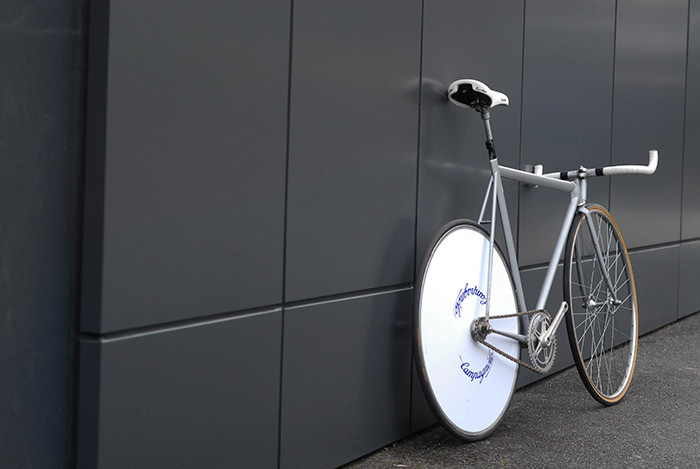 Leo Estermann began building bespoke bicycles in Zurich more than thirty years before beginning to construct these new funny bikes for both track and road. 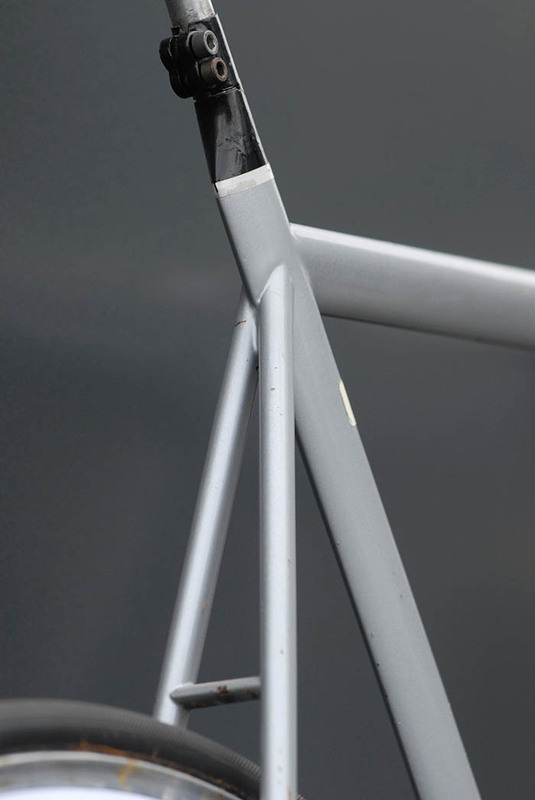 Leo Estermann's custom frames built from the 1960's onwards were detailed with his own siganture lug cuts. 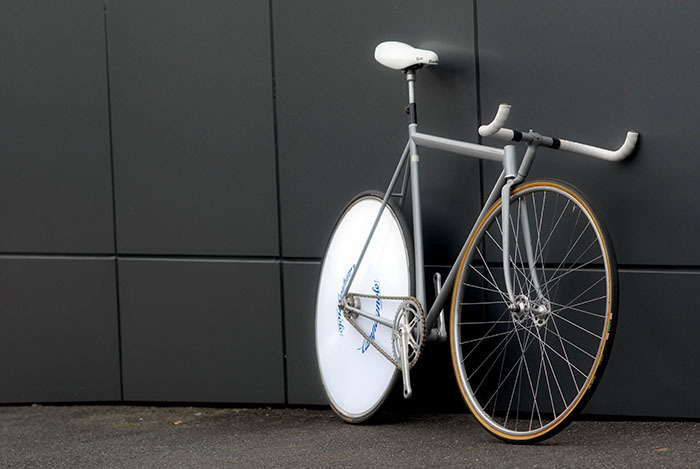 This fillet brazed time trial bike is a departure from his more traditional lugged steel work. The beginning of the funny bike era in the late 1970's saw the start of a trend oin fixing the stem and bars direct to the top of the fork crown. Obviously for the low aero position. Later this trend moved towards stock handlebar stems to fit different riders to bikes more easily. This well used bar end cap has the patina of thirty five years use on the Leo Estermann funny bike. Custom steerer tube and fork cap. 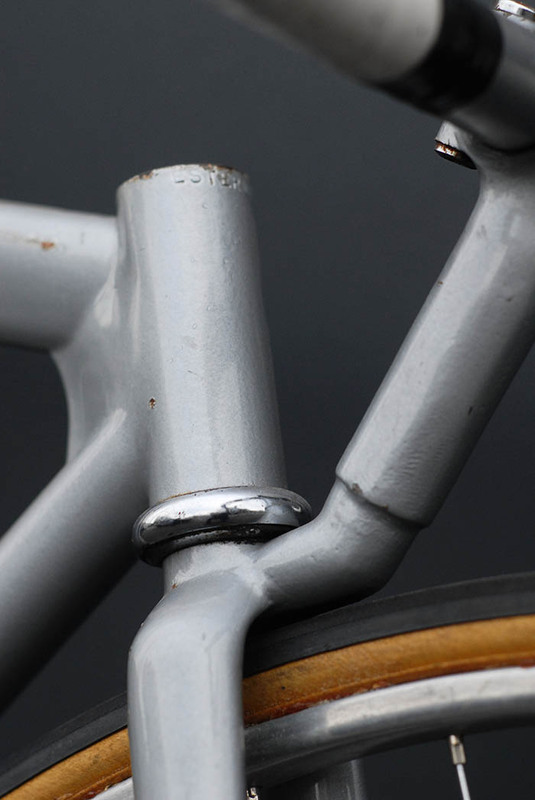 Every detail of this Estermann track bike is bespoke. Leo Estermann's smashed letters in the head tube aren't as precise as some of his other custom frames. The NN look more like VV. Going by the series of serial numbers on Leo Estermann custom frames, this frame was probably built about the end of 1980, bearing the number 1511. 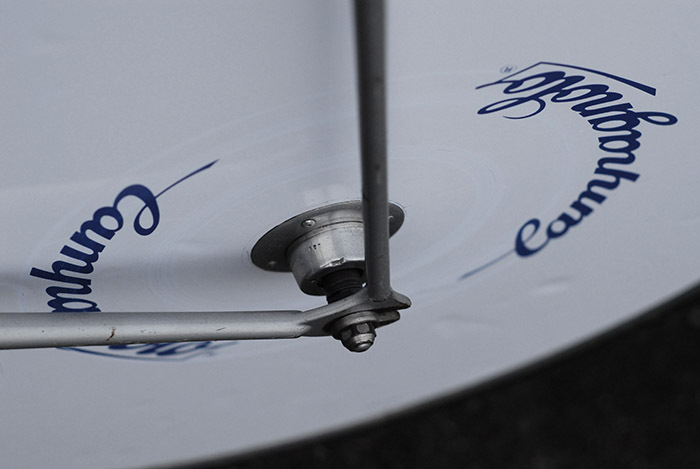 The Campagnolo disc wheel is a recent addition to the Leo Estermann built funny bike. The upturned bulls horn handlebars have seen some vicious action. Probably Cinelli bars and identifying marks long gone. 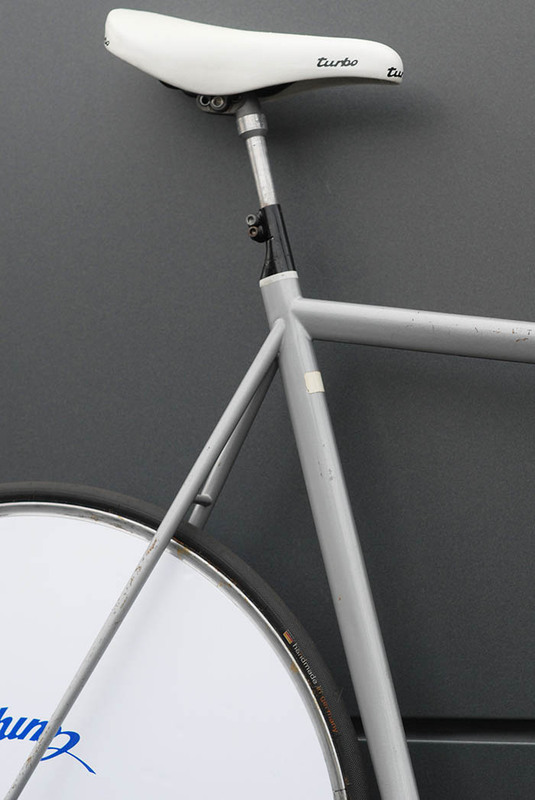 Some of Leo Estermann's frames received decals with "Cycles Estermann Zurich" not this funny bike. 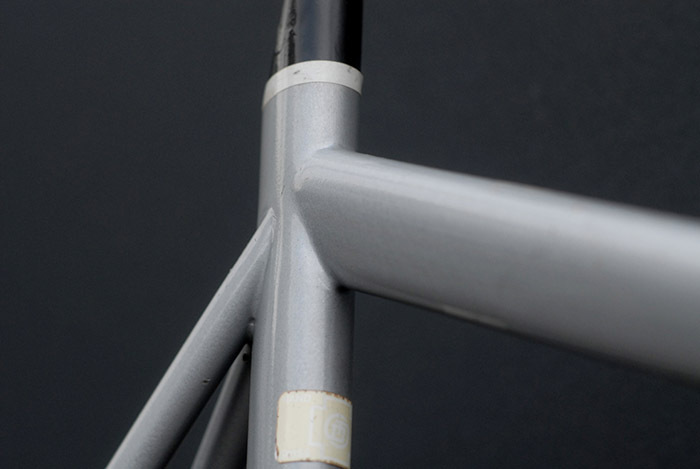 Painted in an austere grey, apparently a signature colour for many Estermann built frames. Tight clearances on the the forks of Leo Estermann's track funny bike. 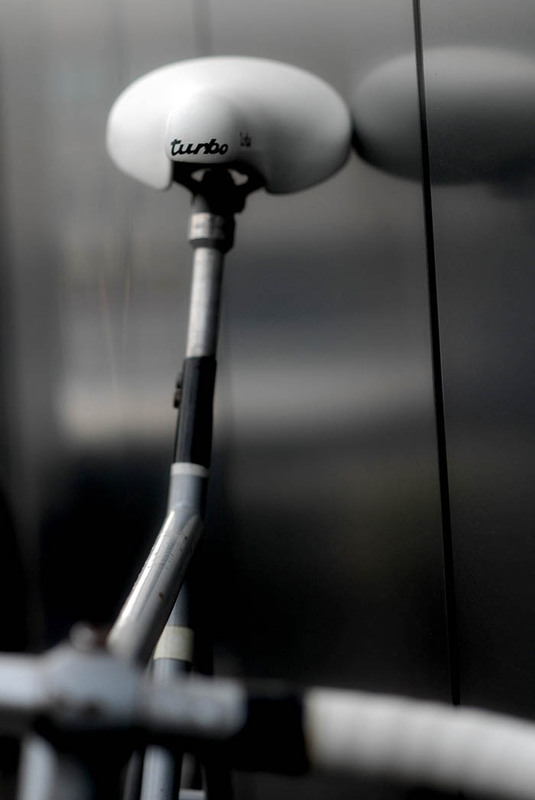 White Selle Italia Turbo saddle. Zurich built ridden and raced in Australia by cyclist Kenrick Tucker. Leo Estermann Cycles frame number 1511 built in Zurich about the end of 1980. 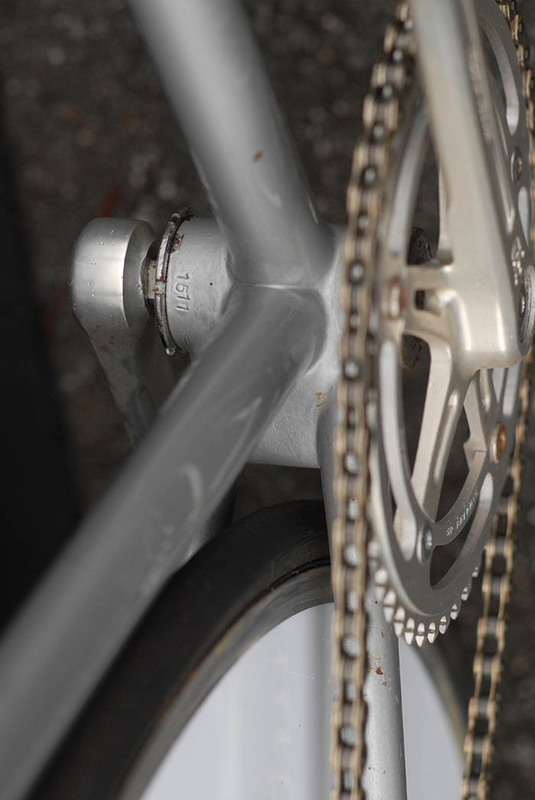 Chunky bridge, filling the void between the bottom bracket and chain stays. Bespoke and low, the name of the game for early 1980's bikes built to race against the clock. Time worn Leo Estermann track Krono. Outside Crankstar Bespoke, the Leo Estermann built funny bike. Leo Estermann's early 1980's track time trial funny bike, in the window at Crankstar Bespoke Brisbane. Tied and soldered front wheel.